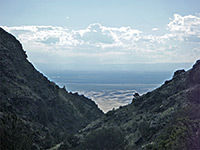 The majority of visitors to Great Sand Dunes National Park explore only the sands and adjacent Medano Creek, but the preserve also contains a sizeable section of the Sangre de Cristo Mountains where the land rises up to 5,500 feet above the valley floor, at the summit of Tijeras Peak. The main high elevation region, which includes several Alpine lakes, is difficult to access, reached from the west by the 4WD Medano Pass Road, or from the east by a better quality track starting along Hwy 69, a 108 mile drive from the visitor center. But there is one path into the mountains that starts beside the dunes; the 3.5 mile Mosca Pass Trail, which follows a fairly narrow valley up towards a low point in the mountain crest. The elevation gain is not too great (1,520 feet) and route is never particularly steep. It might be expected that the trail would give increasingly spectacular panoramas of the sand dunes, but apart from a few glimpses near the start, the views are only of the valley sides, since the drainage is quite gently sloping, and slightly winding, so the sands are soon hidden. 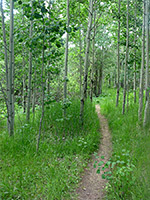 The path encounters varied terrain including dry meadows, moist meadows, dense woodland and exposed slopes with yucca and cacti, but no parts are particularly exciting. Perhaps the main reason for hiking, in spring and summer, is the large number of wildflower species; at least 50 of them can be found, producing blooms of many different colors. Certainly very few people complete the full hike. The path ends rather anticlimactically at the edge of an anonymous grassy field, from where a vehicle track continues eastwards; there are no long distance views from the pass, although a lot more can be seen by a short hike up the adjacent hillside. The path shares a parking area with the Montville Nature Trail - a paved pull-out on the east side of the park road, 0.2 miles from the visitor center. The nature trail (a loop) runs close to Mosca Creek for a few hundred feet, through shady, cool woodland, then rises over an open hillside dotted with cacti, affording good views of the dunes, before ending by dropping back down towards the stream. The Mosca Pass Trail branches off about the third of the way along the loop, just after crossing the small creek. 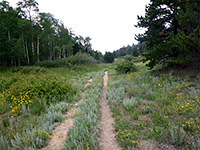 After leaving the nature trail, the Mosca Pass Trail climbs through a mix of pine woodland, aspen groves and open areas, up the north side of the valley, close to the stream but mostly out of sight some way above. A sign marks the edge of the National Preserve, the wilderness section of the park, which covers most of the mountains. The next part of the path crosses rockier slopes, less vegetated, where the only trees are quite far below, beside the stream. The opposite side of the canyon is more overgrown since it receives less sun and so retains moisture for longer. The valley is narrow and V-shaped, and the open section of the trail has some views of the sands, already 600 feet below, but these are soon hidden as the land becomes flatter, the canyon floor widens, and the woods return. The path runs for a while through deep, dark forest, and across little clearings filled with long green grass and a good mix of wildflowers. The stream is closer now, though the amount of water is low, and by the time the forest ends, replaced by a long, nearly flat meadow, the creek is usually dry by midsummer. A gentle, sparsely wooded slope leads to a fence and NPS notice, seemingly at the end of the trail, but the actual pass, and the national preserve boundary, are 1,000 feet further on the far side of a grassy field. 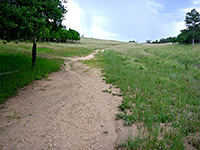 This section, and the last half mile or so of the trail, are along an old vehicle track. From the pass, a much better track, often fine for all vehicles, heads down the far side of the mountains and eventually reaches Hwy 69. Forested slopes rises to the north and south around the pass, so there are no long views in any direction.